Ajmal Ahmadzai never caught election fever. While millions of his peers lined up outside schools, mosques and hospitals to dip their fingers in blue ink, the 27-year-old spent Election Day at home texting and taking pictures on his smartphone. April 5, 2014, had been billed as a historic day: the first peaceful, democratic transition of power in modern history. But little in the two-month presidential campaigns was able to convince Ahmadzai that the rainy day would reverse a three-decade-long status quo in Afghanistan. “Candidates always use the name of jihad, but we have yet to see the result of them doing something good for the people,” Ahmadzai said of a candidate pool composed mostly of fighters turned politicians. As Afghanistan prepares for a second round of campaigning between the two frontrunners, Ahmadzai’s sentiment reflects a common frustration among the people. For many Afghans who did not cast ballots in the nation’s third presidential polls, the shifting political structures of the last 30 years – communists, warlords, Taliban, and the Karzai government – have done little to change the power dynamics of the nation. In a study of youth politics conducted ahead of the polls, the United States Institute of Peace found that many young Afghans were skeptical of those seeking office as remnants of long-standing power structures. “The only candidates whose tickets that had no thieves or warlords stood no chance at winning,” Habib Zahori, 30, said. Among the eight candidates vying for presidency were technocrats who served in the 13-year administration of Hamid Karzai, former militia leaders, a former deputy in the nation’s second-largest armed opposition movement, and a member of the royal family. “In Afghanistan, change cannot come through an election,” Zahori told me. In place of detailed policy platforms for the future of Afghanistan, Zahori and Ahmadzai said many of the candidates relied on their historical ties to gain the people’s attention. For months, the streets of the capital were lined with posters of presidential candidates in suits and ties or traditional piran tomban as the disembodied heads of deceased jihadi leaders looked on in the distance. For Afghans who lived through the civil war of the 1990s, the composition of the presidential tickets were a stark reminder of the battle over the capital that led to the deaths of more than 40,000. “Hundreds of our own people have died because of these men and if we voted for them, we would be responsible for their sins,” Ahmadzai told me. This reliance on ethnic and historical ties was especially troubling for people like Ahmadzai, who comes from a mixed family of Afghanistan’s two largest ethnicities: Pashtun and Tajik. His mixed ethnicity turned a political struggle between leading candidates Ashraf Ghani Ahmadzai – former finance minister – and Abdullah Abdullah – former foreign minister –into a personal one for the 27-year-old. Though Abdullah is the son of a Kandahari Pashtun, he gained prominence as a close ally and spokesman to Ahmad Shah Massood – the Tajik jihadi commander who is regarded as a “national hero” to some and a warlord to others. With an estimated 35 per cent unemployment rate, Ahmadzai was also troubled by what he said was a lack of vision for the nation’s future. “The majority of the youth are educated, but unemployed. Even with all of the aid, no one managed to create a situation for the youth to be able to get work and earn their own livings,” said the university graduate, who works as a waiter at a shisha bar patronized mostly by rich Afghans. Obaid Ali, a Kabul-based analyst who spent the days leading up to the election in Kunduz province, said for youth outside the major cities it was the security situation, and not philosophical misgivings that kept them from casting ballots. Several young people Ali spoke to in the northern province reported intimidation and intrusion by regional strongmen, many of whom supported Abdul Rab Rassoul Sayyaf – a former regional commander – as a deterrent. 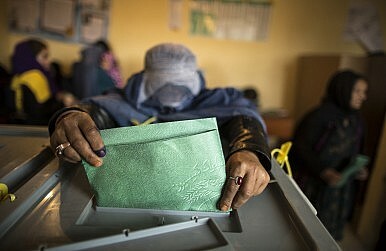 Though votes were cast by secret ballot, locals in three districts of the northern province feared strongmen could exert their influence to gain access to the vote counts. Others in Kunduz echoed a commonly held Afghan belief that “the president is chosen by foreigners, not Afghans” as proof that their votes would have little impact. Though the streets of Kabul and other major cities were lined with members of the Afghan National Security Forces, in Kunduz, where the armed opposition has a strong foothold, the threat of attack also kept many young people from lining up to vote. The Taliban, the largest armed opposition group, has issued repeated threats to anyone partaking in any election-related activity. “Kunduz was one of the areas that the Taliban issued night letters warning people not to vote. This lead several mullahs to declare the election un-Islamic,” Ali told me. Daoud Sultanzoy, a former parliamentarian turned presidential candidate, said any lack of youth engagement in the election was also the fault of the political establishment. The 2009 polls, which saw Hamid Karzai and Abdullah face a two-man runoff, was marred by claims of rampant corruption. The allegations included ballot papers pre-marked with Hamid Karzai’s name seized and subsequently burned by election monitors. In other areas, many more votes were cast than there were eligible voters. Though Sultanzoy told me that many of the youth he spoke to as part of his campaign were not driven by tribal, religious and regional divides, those were the exact cards other candidates played. “The political system in Afghanistan is led by gunrunners and people with money, not political ideologies and parties,” he said. Still, he said such a historic moment is exactly when the youth should rebel against the status quo and insert themselves in the process. Ali Latifi is an Afghan-born, California-raised journalist currently based in Kabul. He has written for The New York Times, The Christian Science Monitor, Al Jazeera English, VICE News and the Asia Times. Saturday’s election may be critical, but Afghanistan isn’t about to become a stable state anytime soon.